The 2015 Ford Shelby GT350 Mustang has been built to beat any other muscle car around a road course, but for those 2015 Mustang fans who want a Shelby that will challenge the Dodge Hellcat in a straight line, the 2015 Shelby Super Snake has arrived – with power levels reaching 750+ horsepower. The 2015/2016 Ford Shelby GT350 Mustang is expected to be the most track capable Mustang ever, if not the most track capable muscle car ever, but it is a fairly safe bet that the 526 horsepower GT350 won’t be able to hang with the 707hp Hellcat Challenger on the quarter mile. While there are plenty of Ford fans excited about the new GT350 based on its abilities to dominate a road course, there is no denying that the Ford Mustang is a popular model at drag strips all over the country. For those Mustang fans who want something new to take drag racing against a Hellcat Challenger, the 2015 GT350 isn’t going to get the job done, so the folks at Shelby American came up with a new post title package that lifts the output of the 2015 Mustang GT up over 750 horsepower – and they are calling it the Super Snake. The Super Snake name has been used on some of the most powerful modern Ford Mustangs, so it should come as no great surprise that Shelby American picked that name for their new high performance package. Unlike the previous Super Snake models that were based on the Shelby GT500 Mustang, this new package is based on the far more affordable 2015 Mustang GT. To create the 2015 Mustang Super Snake, Shelby American adds a variety of unique components inside, outside, under the hood and under the car, transforming the new Mustang GT into a proper super muscle car. 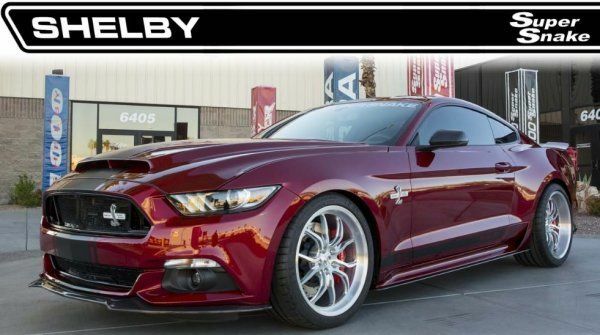 The package begins on the outside, where Shelby American adds a collection of carbon fiber body bits including the new front splitter, a hood with a massive front-mounted air inlet, mirror caps, lower rocker panels, a rear spoiler, a new taillight panel and a lower diffuser. The Super Snake package also includes a unique grille filler in black or aluminum, all of the striping and badging for the special package and the great looking, lightweight Super Snake wheels. On the inside, the Shelby 2015 Mustang Super Snake package adds a numbered dash plaque and a 3-gauge cluster with boost, fuel pressure and oil pressure readouts. the 2015 Ford Shelby Super Snake Mustang comes with two different levels of performance – 650+ horsepower and 750+ horsepower. The 650hp package is technically the “base” package while the 750hp setup is optional. To create the 650+ horsepower 2015 Super Snake Mustang, the 5.0L V8 of the Mustang GT is fitted with a Ford Racing supercharger, a Ford Racing exhaust system and a Shelby cooling package to help the car make more power while Ford Racing half shafts and 3.73 gears help get the power to the wheels. To improve the handling, Shelby adds a Ford Racing suspension setup, Wilwood 6-piston front brakes with huge drilled rotors and the unique 20 inch Weld Racing wheels wrapped in high performance rubber. The 650hp Super Snake Mustang also comes with a numbered engine plate, an engine cap set and a short throw shifter in those models with the 6-speed manual transmission – although this Super Snake can also be built on Mustang GTs with the 6-speed automatic transmission. The 650+ horsepower package costs $49,999 and that does not include the cost of the 2015 Mustang GT needed for the build by Shelby American. You can get into a 2015 Mustang GT fastback for $33,200, so the total cost of the new Super Snake sits right around $83,199 before adding any options. The 750+ horsepower package for the 2015 Mustang Super Snake is more than just a power increase, as this package also includes an upgraded engine cooling package, a rear differential cooler, a transmission cooler, Wildwood 4-piston rear brakes, a brake cooling duct kit and a one-piece driveshaft. Other than the components replaced by the 750hp package features, all of the items on the “base” Super Snake are carried over to the 750hp package and, most impressively, this package costs just $5,000 more. The 750hp Super Snake Mustang package starts at $54,999 so when added to the $33,200 base Mustang, you have a 750 horsepower muscle car that costs around $88,199. The bad news is that Shelby American will only be building 300 examples of this package for 2015, so if you have a new Mustang GT and you would like a new Shelby Super Snake that will hang with the Dodge Hellcat Challenger, you would be wise to contact Shelby American soon to reserve your Super Snake package. Serious? $88,200 Super Snake Mustang vs $63,480 Hellcat Challenger . 300 Super Snakes projected to be produced vs 2211 Hellcats Challengers actually produced in their first year alone. For the price of a loaded up 3/4 ton diesel truck, anyone can walk into a dealer and either drive out with a Hellcat Challenger or get on the list to receive an ordered one.. Sorry but this article is silly fantasy. The Super Snake will be hunting nothing but private domestic and overseas collections IF it is even produced. Tell Ford to boost the HP of the GT350 a bit and lower its weight a bit THEN you can realistically go Hellcat hunting at a local dragstrip. You forgot one important point. Why would any normal person want to buy a Hellcat instead of a Super Snake. The only silly fantasy I've read on this page is in the comments section. The hellcat is also as heavy as a diesel truck. The super snake is lighter, it is faster, it has more horsepower than a Lamborghini aventador. This car is a super muscle car, best in about every way than a hellcat. I have a new 2005 at the cost of 28,000 has less than 9000 miles on the car I keep the miles down on the car and it still smell brand new inside with 10.000 cash add on that makes the total cost of less then 40,000 dollars and can drive the car every day because it was number 7 off the assembly line I don't drive it but on weekend with a little over 2000 hp to the rear wheels grant it's not the 2015 super snake but I call it old henry that what they nick name it at the race track went it was brand new back in 2005 before all the add on. But.....it's burgundy and ugly. It's not stock like hellcat. It is a package. Ford and chevy are mad because they didn't do what dodge did first. Plus camaro and mustangs are on every corner. Not the challenger. Ugly ? I guess beauty is in the eye of the beholder . I love the small fastback roof line this year . The Hellcats run strong but carry too much weight, NOTHING is running with the COBRA JET Mustangs in Super Stock classes at the drags. They are running low to mid 8 second times and winning most major events.